I am probably one of the very few people out there who did NOT read The Art of Racing in the Rain. I remember the many readers and customers from Borders raving about it but I just didn't get to it. 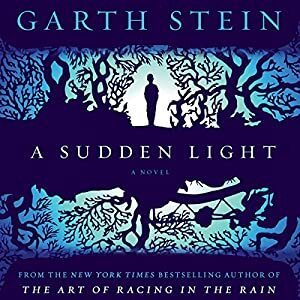 I am, however, very happy that I got to his latest novel, A Sudden Light. I was sent a copy to review from Simon and Schuster Audio who have graciously filled my audio lovin' heart with amazing stories as of late. This book was magical. The narrator was so talented in his abilities to bounce from one character to another, up to seven different voices. This book is perfect for this time of year with all of the ingredients to spook you. You have the old haunted house, a family with secrets, and plenty of ghosts. I felt so strongly for all the characters, never really hating the ones you were supposed to or loving the ones who seemed to have the most to lose. They were all flawed and real and I was sad to leave them them in the end. Listening to this story brought on such a power of empathy. Once again, the narrator nailed it. You really felt you were listening to multiple people telling this story. It made it even more real. I highly recommend to audio book to lovers of solid literary fiction with a twist of suspense. Perfect for the Halloween season! I never read The Art of Racing in the Rain either, but I enjoyed this, too! I didn't know that this one had a spookiness to it. Very different from The Art of Racing. Looking forward to reading it!